Well, I like this gorilla. He just called to me. He looks more like a man in a suit than a true gorilla. 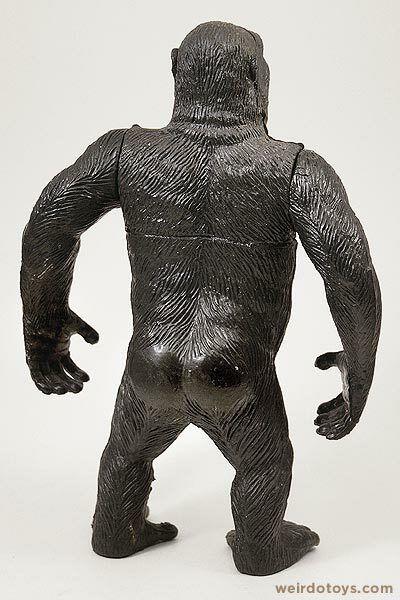 This big, black, angry primate is by Imperial Toy. I’m not sure what year this toy was released. Probably the 70s or 80s from the looks of him. I have a feeling it’s supposed to be reminiscent of King Kong. See the resemblance? I don’t see any marking giving rights to a movie studio or anything, so this is probably just a generic giant gorilla. I’ll call him “Kong King.” He’s supposed to fight some of those dinosaur toys Imperial made in the 80s. You remember those dinosaurs? 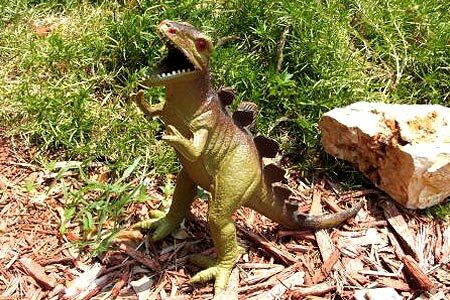 I actually had this dinosaur as a kid. Dinosaur image courtesy of Cretaceous Central. Thanks! I remember dropping those little green army men into his mouth, filling its hollow plastic torso with unlucky soldiers. (It was always hell to get the dinosaur to regurgitate them though.) I would even squeeze his mouth shut repeatedly to make the act of eating that much more convincing. 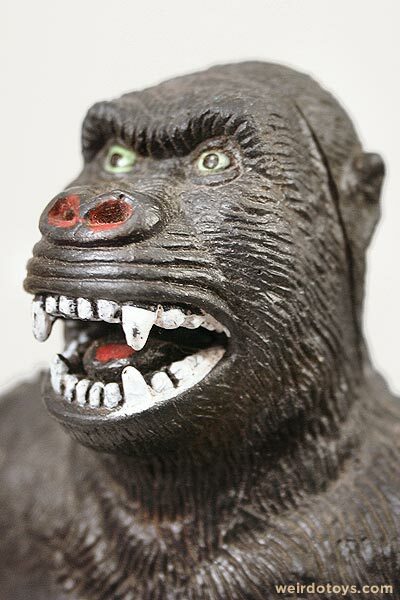 Kong King is plasticy, goofy-looking, has minimal paint applications and has very obvious construction seams. He has two points of articulation at the shoulders. 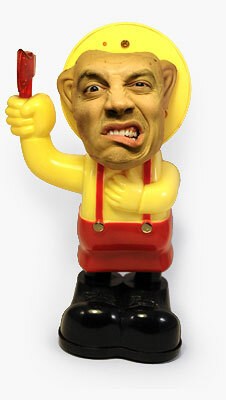 The rest of him is just a hunk of hollow, flexible plastic. … and what’s with coconut bra? 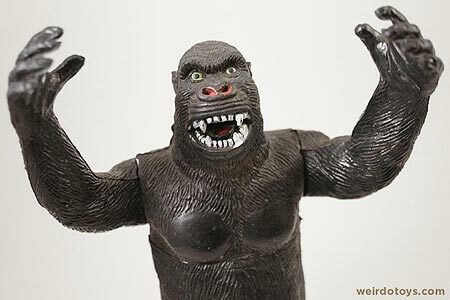 Buy King Kong toys on eBay! I hadn’t even thought about that dinosaur until I started writing this blog entry. I have a very similar Gorilla figure except it has two red led lights for eyes and a button on his chest. When you push the button he kind of makes a weird snoring/growling/moaning noise and his eyes flash on and off for a few seconds. It’s made of hard plastic too. but the sculpt looks to be the same. Man, your toy sounds so much cooler. I wish I’d found a roaring, laser-eyed gorilla toy instead. I got that same Kong last year. It is an officially licensed King Kong, and I think it was released in ’85 or thereabouts. Thanks for the tip Bubba Shelby. The car in Kong’s hand was a nice touch. Too bad I don’t have any small cars lying around. I just have to say WOW! All you’ve done on this site is so AWESOME! I had a gorilla like that when I was a kid. I totally had one of those dinosaurs when I was a kid, back in the eighties. I would attack the Star Wars figures with it for some reason, and the simulated chewing mouth movement was a must for me too. Amazingly, in Asia KING KONG is called KONG KING. 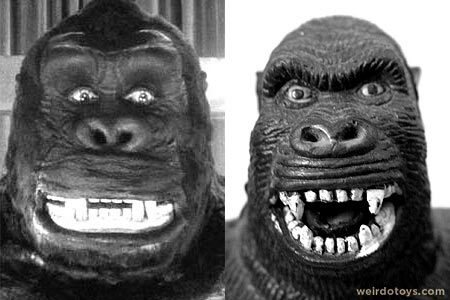 Kong actually means King in Korean whereas King has no meaning. @ Simon – Thanks for the support, Glad you like the site. @ Fae Cthulu – Funny that we both did the mouth chewing thing. A modern dinosaur toy would growl, animate and have a chewing action all activated by the press of a button. Also, it wouldn’t be hollow, because it’d be filled with electronics. OH! I still have this very same dinosaur–I got him at McCrory’s when I was a kid, and I remember him seeming so HUGE in my little hands. Even the display box he was in advertised them all as GIANT DINOSAURS. I had one of those as a kid. I always thought it was creepy, but I didn’t expect to find it here. 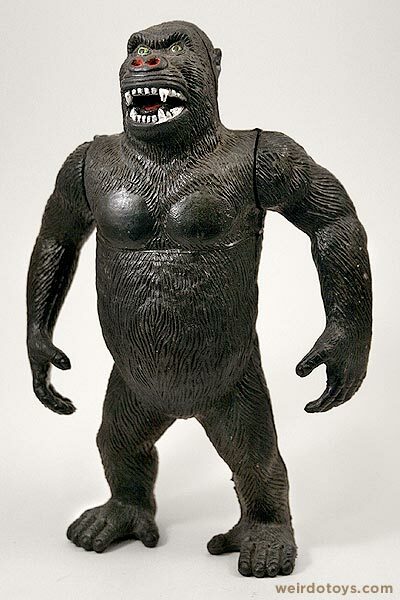 The king kong figure was part of a Sears catalog collection “Classic movie monsters”. Others in the set included Frankenstein, Dracula, Werewolf and possibly one other that escapes me. I have this Toy too. 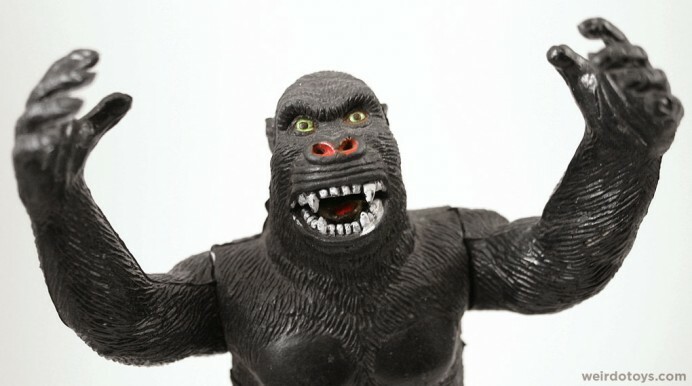 It is a king Kong Toy that I got in the 90’s. I’m not sure when it was released, but I can say for sure that I bought mine new at a Toys R Us in the early 90’s, probably ’92. I also bought this with a Godzilla toy that was in the same bin and made in a similar fashion…I still have both!